Submitted by Taps Coogan on the 24th of January 2019 to The Sounding Line. The following map, from the cost estimation website HowMuch.net, shows how much direct foreign investment countries around the world received in 2017, the most recent year for which complete data is available. 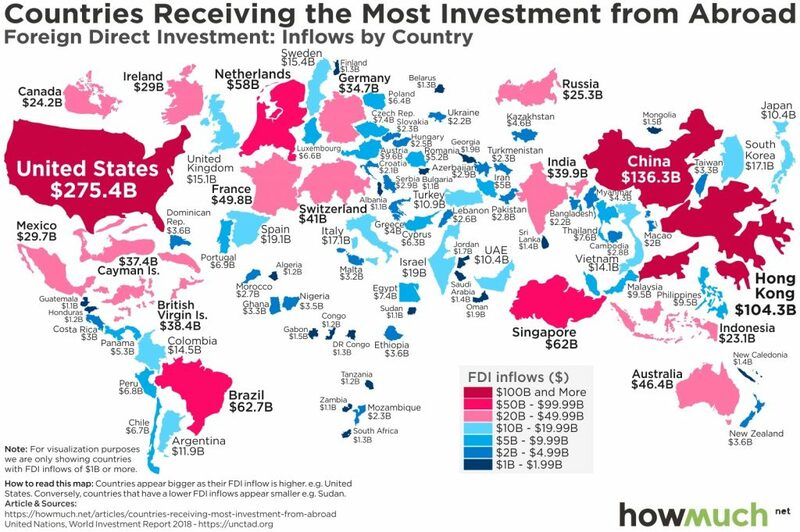 The United States remains the largest recipient of foreign direct investment ($274.4 billion), with China close behind when including Hong Kong in its total ($240.6 billion). Other top recipients include Singapore ($82 billion), the Netherlands ($58 billion), and Brazil ($62.7 billion). Countries receiving less than $1 billion were excluded from the map. Despite all that is written about its growth potential, Africa still receives virtually no direct foreign investment, nor does Eastern Europe and Central Asia. Taiwan and Japan also receive surprisingly little foreign direct investment considering their large and advanced economies. Why is there any investment into China. It is a failed choice.